A Memorial Mass will be celebrated on Friday, February 8, 2019, at 10:00 am at the CATHEDRAL OF ST. JOHN THE EVANGELIST, 914 St. John St. in Lafayette, for John Allen Bernard, 90, who died on Saturday, February 2nd at his residence in Lafayette. Reverend James Brady, Pastor of St. Pius X Catholic Church in Lafayette, will be the Mass Celebrant. Born and raised in Lafayette, John graduated from St. Joseph Seminary in Saint Benedict, LA and Southwestern Louisiana Institute, now UL-Lafayette. He subsequently enlisted in the United States Air Force and served in Korea. 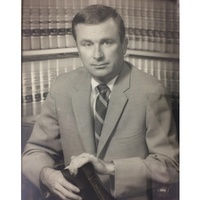 After his tour of duty, John attended Tulane Law School and in 1957 graduated, returned to Lafayette and joined the law firm of Davidson, Meaux, Onebane and Donohoe. John retired from the practice of law with Onebane, Bernard, Torian, Diaz, McNamara and Abell in 1996. John was an avid sports fan and long-time booster of USL football and basketball. He loved nothing more than to spend the day chasing the perfect game on the golf course at Oakbourne, alongside his best friends, and will be deeply missed. Mr. Bernard is survived by his three daughters, Stephanie Bernard Santini and her husband David, of Baton Rouge, Mary Bernard and her husband William Meaux, of Fairfax, VA and Elizabeth Aline Bernard and her husband Robert Higgs, of Xcalak, Mexico; and his seven grandchildren, Jonathan Santini, Cecilia Santini, Daniel Meaux, Thomas Meaux, Virginia Warnken Kelsey, John Allen Hunley and Ava Hunley. He was preceded in death by his parents, Fernand C. Bernard and Aline Blanchet Bernard; and his brother, Jack F. Bernard. The family would like to thank Hospice of Acadiana, especially nurses Joeann Harrington and Amy Green, for the compassionate care given to John. The family would also like to express their great appreciation to Becky Cahee, Mary Andrus, Rosalind Simpson and Judy Evans for the loving care given to John during the last months of his life. In lieu of flowers, the family requests that donations be made to the St. Joseph Abbey in Saint Benedict, LA at (985) 892-1800, or Hospice of Acadiana in Lafayette. Online obituary and guest book may be viewed at www.fountainmemorialfuneralhome.com. Fountain Memorial Funeral Home and Cemetery, 1010 Pandora St., 337-981-7098 is in charge of arrangements.